In honor of my beautiful mom’s birthday, Beth and I traveled up to Napa to join my sister Shauna and my parents Donna and Ed, for a day spent on the Napa Valley Wine Train (NVWT). The Wine Train has had a long and sometimes contentious history in the Valley. The movement to start the NVWT was headed by Vincent DeDomenico of Rice-A-Roni fame, among many other food brands. The long legal battle was bitterly fought throughout the valley with many residents against the idea, including my own grandfather Bud Schroeder. Local protesters argued that the Valley was already fraught with enough tourists, a rather reasonable view, actually. Eventually the legal battle ended up in the California Supreme Court, where DeDomenico et al prevailed. The original dissension has dried up over the last 18 years of operation and, for the most part, the Wine Train is now an accepted part of Valley life. We started the day off at 11:30 in the Napa Wine Depot, trying a complimentary house wine Chardonnay and the red poured by the staff as we waited for the train. I found it pretty impressive that the red was a Pinot Meunier, a rarely grown grape that is usually found as a blending varietal in Champagne and other sparklers. I initially heard that it was a Pinot Noir, however, and I was befuddled as to lack of varietal character until Shauna set me right. Once the train arrived, we headed out to the boarding area to begin our journey. 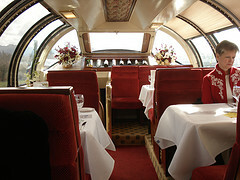 There are multiple types of lunch and dinner trips that you can take on the Wine Train. 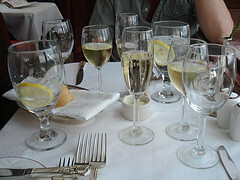 We ended up going all out and choosing to book the premiere lunch package in the Champagne Vista Dome car. Unlike all of the other packages, you can spend your entire journey in this car, although you are not required to do so. The trip started with a complimentary glass of Mumm Blanc de Noirs (one of my favorite Napa sparkling houses). After traveling through some of the workday parts of the city, we headed up towards Yountville and some of my favorite views of the Valley. One of things that I loved about the Wine Train and didn’t initially expect, was just how much more you notice during a leisurely ride Upvalley. I have driven Upvalley hundreds of times in my life and an equal number of times as a passenger. Yet, traveling at roughly the same speed as a brisk bicycle ride reveals many new treasures along the way. Beth and I commented on this effect throughout our journey to and from St. Helena, the end of the line. Our guide and waiter for the day, Scott, was a rather learned resident of the Valley. A continually humorous aspect of the day was provided by my father, however. He is a massive history buff, particularly within California and my hometown of Napa. That day he had an incredible knack of telling a story about some part of the scenery about 5 minutes before Scott launched into the same spiel, unbeknownst to either. This must have happened at least six or seven times. We then proceeded to nominate him as our favorite tour guide for the Train from there on out! My father brightened the mood of our two tables even further when he offered to buy two bottles of wine of my choice from the standard wine menu. We ventured forth with a Cuvaison Carneros Chardonnay (quite tasty and new a favorite for my mom and Shauna) and the Franciscan Napa Valley Merlot. Lunch was a beautifully presented and very well executed 4 course affair. I started off with the flour-less squash ravioli (better than I thought it would be) and the seafood bisque soup du jour. My entrÃ©e choice was the Roasted Beef Tenderloin with Roasted Garlic in a Cabernet Veal Demi. Yummy. Beth’s Blue Nose Sea Bass was not quite as tasty, but still enjoyable. 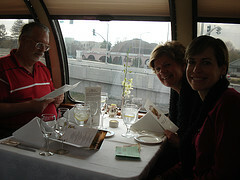 During the hour or so interlude between lunch and dessert, we headed down the train towards the tasting car where we used our free tasting coupons from VIA magazine to make sure that we tasted more than enough wine on our trip. The bartender was a very knowledgeable local who whole-heartedly agreed to open a couple new bottles of red when my father and I discovered that our first two choices had been open for too long and had oxidized. I learned some more tidbits of local winery info during my time chatting with her about each wine, with my favorite of the 6 that I tried being the Shypoke Charbono. We finished with a large array of deserts, including the crÃ¨me brÃ»lÃ©e that we saw in other cars that wasn’t offered in our car. I tried to pay for the extra dessert but Scott roundly refused, a very nice gesture that complemented the surprise birthday song and candle that they gave my mother for her dessert. I decided to finish the day with a glass of the Praeger Petite Sirah Port, a winery that resides along the tracks across from Louis M. Martini. After a bit more relaxation and chatting with some Flemish tourists that were traveling through California, we arrived back at the Napa Depot and had our taxi whisk us back to Shauna’s condo and the end of a wonderful day. 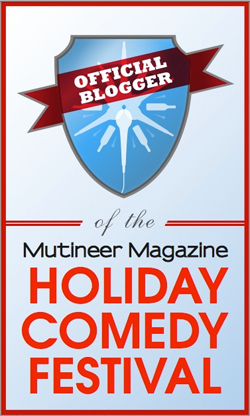 Please check out the links below for reviews of the wines that we had or tried on the trip. All are tagged with “W2007NVWT”.Enjoy!